When you can put pumpkin into just about anything, why stop at Thanksgiving stuffing? That’s exactly what I asked myself when I embarked on creating this recipe for gluten free pumpkin stuffing that combines the flavors of sage, rosemary, thyme, and pumpkin in an unforgettable dish you’re guests will love! It’s a unique, and gluten free spin on a classic Thanksgiving dish that is easy to make and perfect for any holiday get together. I used Simple Mills Artisan Bread Mix as the base, and mixed pumpkin directly into the batter to give the bread an even heartier fall taste. The bread mix is savory in nature so paired with the pumpkin it seriously came out amazing and is something I would make on it’s own any day. Just like all of their products, this bread mix is made with simple ingredients and nothing artificial ever. It’s no secret I’m a big fan of their pumpkin muffin and bread mix as well which is also made from simple, nutrient dense ingredients. If needed you could also substitute the egg in the recipe on the box too. This mix is great for using for this bread because it’s a healthier alternative to other boxed stuffings out there and saves you a little bit of time in the kitchen. I also must admit that I did not used to like stuffing at all. I was an all turkey NO stuffing girl at Thanksgiving on account of hating onions and celery. Last year I tried a bite just to confirm that I was sane for swearing off this dish everyone raves about, and maybe you can guess what happened next–I loved it! Goes to show that sometimes, just sometimes your childhood tastebuds evolve and it’s worth trying something you thought you hated once upon a time! 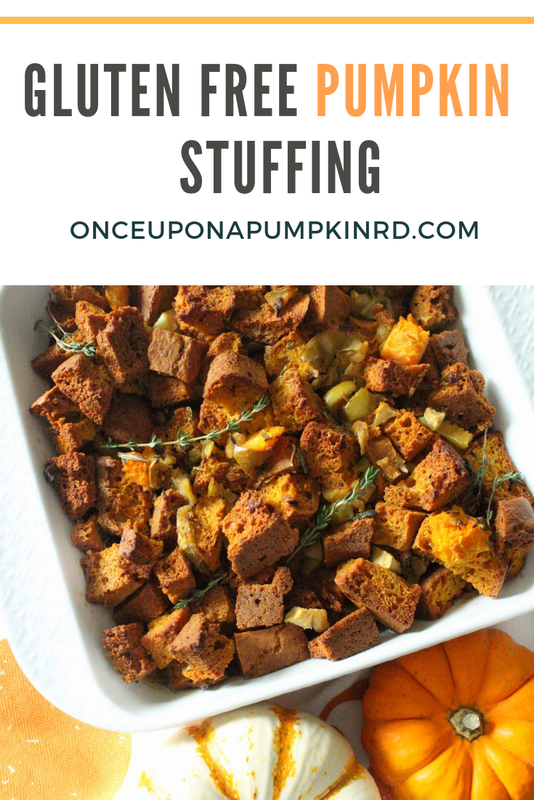 I recently brought this gluten-free pumpkin stuffing to my annual Friendsgiving and gluten and gluten-free friends alike enjoyed it! 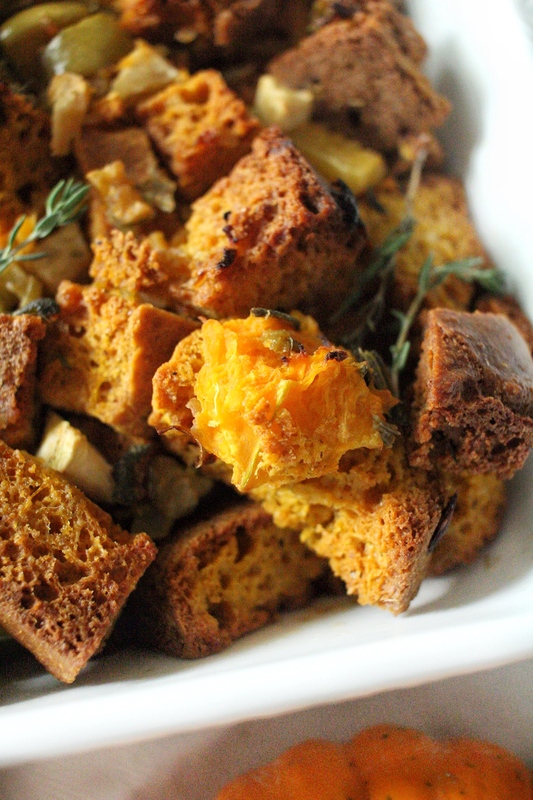 If you’re a pumpkin lover like me, than this squash-ed up version of stuffing is a most try! I added butternut squash too for a pop of orange! For more ways to use pumpkin, be sure to check out this blog post and my new book the Once Upon a Pumpkin Cookbook, with everything from healthy pumpkin spice lattes to homemade pumpkin dog treats and a delicious pumpkin cheesecake that makes for a great Thanksgiving dessert! This post contains affiliate links. The instagram photo associated with this post was sponsored by Simple Mills. As always all opinions are my own and I appreciate you being here! Add pumpkin to your thanksgiving table in more ways than just the pie with this recipe for gluten-free pumpkin stuffing! It’s easy to make and a sure crowd pleaser with all the fall flavors. 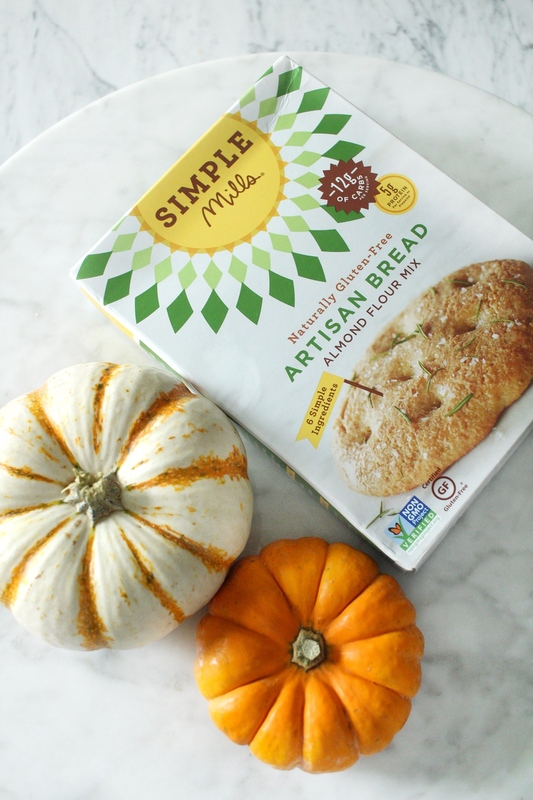 Simple Mills’ Artisan bread Mix add nutrition to this side dish the whole family will love! Prepare artisan bread according to package instructions for a loaf. ** Add 1/2 cup pumpkin puree and combine well into batter. Bake and leave bread out overnight to dry out. Preheat oven to 300 degrees. 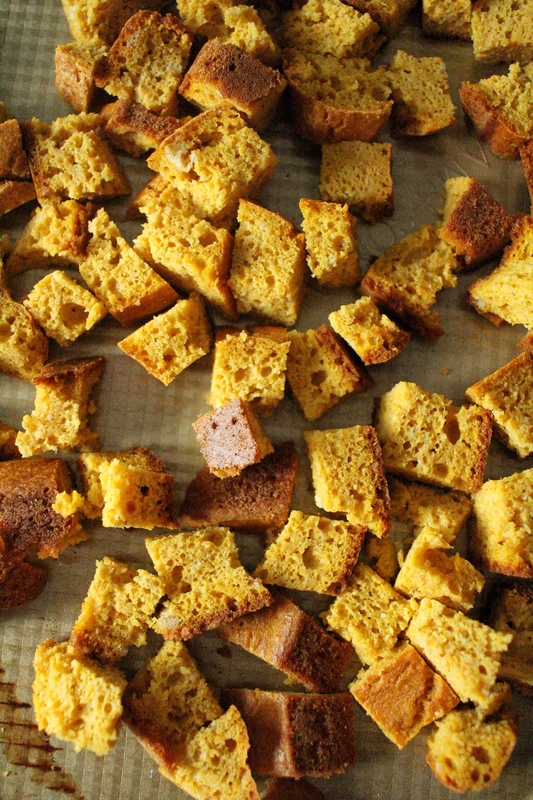 Cut the loaf of bread into small (about 1-inch) cubes. Spread out on a baking sheet. Bake 50-60 minutes or until completely dried out. Preheat oven to 375 degrees F. Grease a 2 quart (or 8×8″) baking dish. Heat butter in a medium pan over medium heat. Add celery, onion and apple and sauté 7-10 minutes, or until very tender. Sprinkle with fresh herbs, salt, and pepper. Add dried bread cubes to a large bowl. Pour broth over bread cubes, working carefully not to smash the bread. When much of the broth has been absorbed, stir in sautéed veggie mixture. Gently pour mixture out into your prepared pan and shake to distribute evenly. Bake 375 degrees for about 60 minutes. Bread will darken a bit and it should look as if all of the liquid has been absorbed. *Roast butternut squash ahead of time or opt for frozen that you can microwave when preparing the rest. **For optimal results prepare the bread a day in advance so that it has time to dry out overnight. 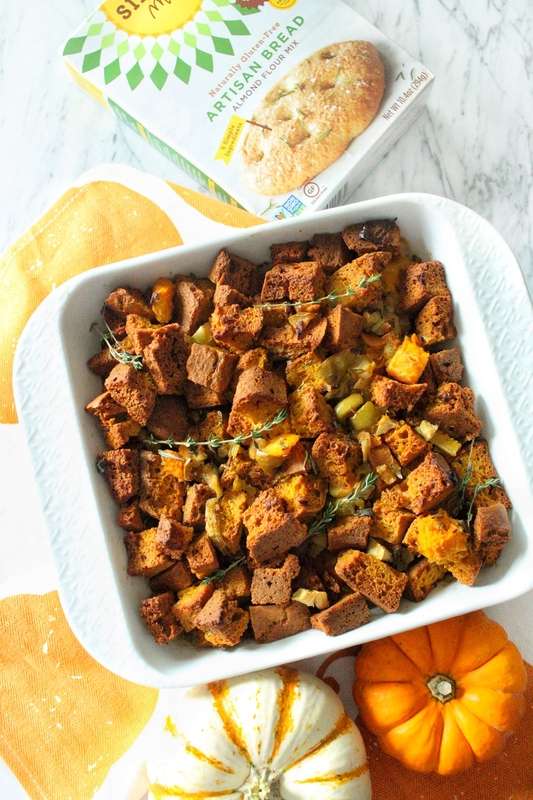 Pin this gluten free pumpkin stuffing recipe for later!